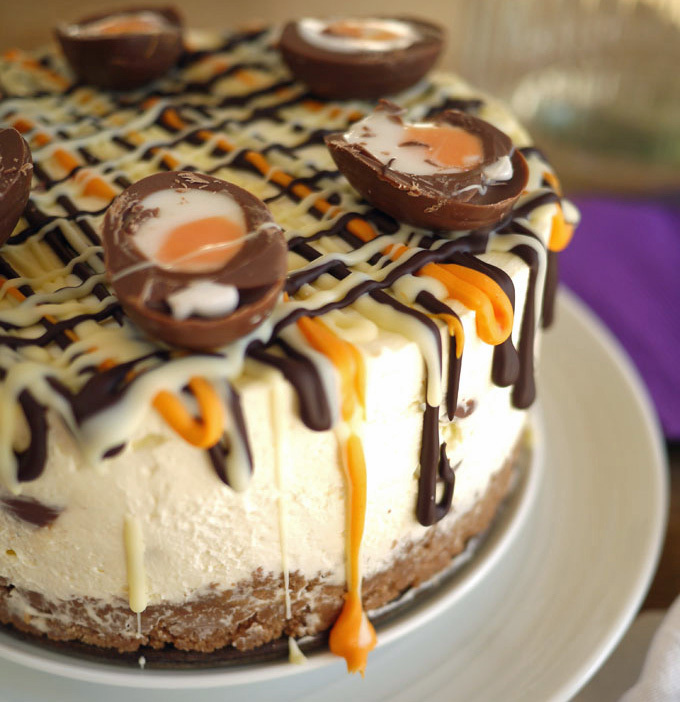 Wow your friends and family with this stunning Cadbury creme egg cheesecake. 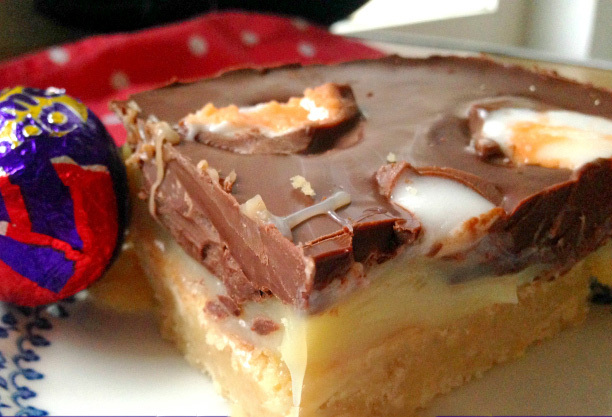 If you can’t find mini creme eggs to use inside the cake, you can just replace them with large creme eggs. Click here. 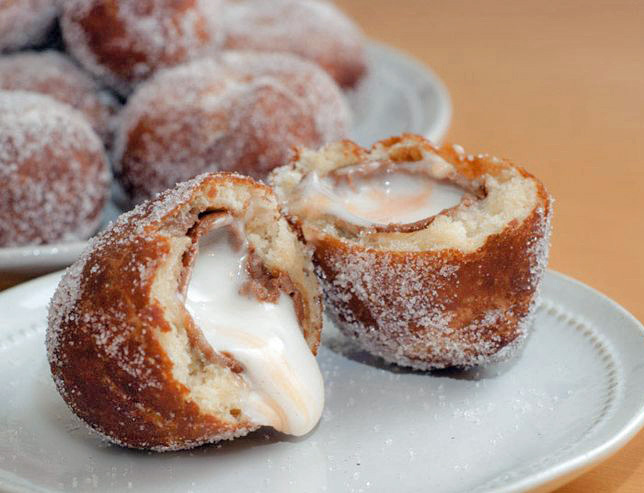 Cadbury creme egg donuts, photo courtesy of cutsqash.com. Full size or mini creme eggs, wrapped in a yeasted donut dough, deep-fried and rolled in sugar, heavenly for any donut fan. Click here. Your favorite Cadbury creme egg in milkshake form! Chocolate ice cream and homemade fondant cream blended together for a sinful Easter treat. Click here. Cadbury creme egg cupcakes, photo courtesy of cupcakestakethecake.com. 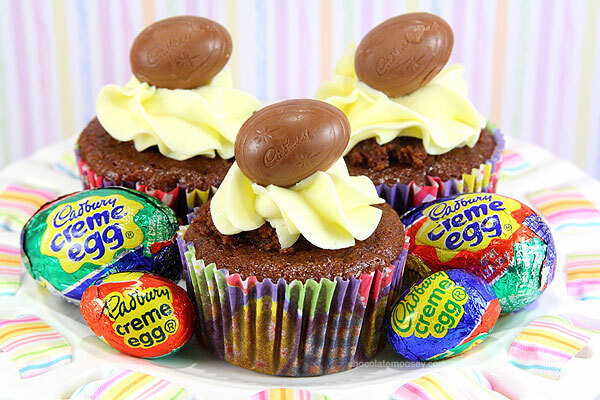 These Cadbury creme egg cupcakes are intensely chocolatey Devil’s Food cake with lightly flavored vanilla Cadbury’s creme egg buttercream, delicious! Click here. Cadbury creme egg stuffed chocolate chip cookies, photo courtesy of chocolatemoosey.com. 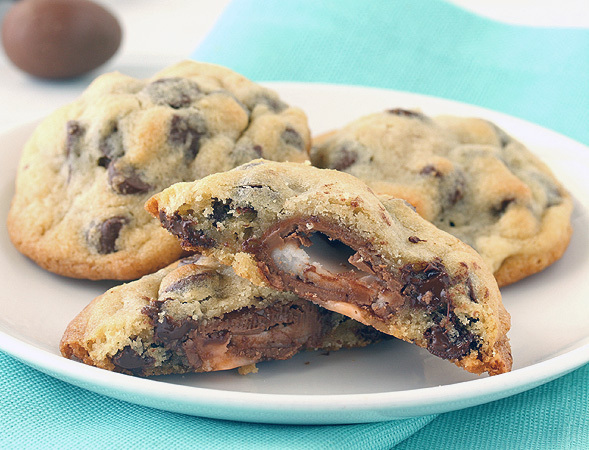 Classic chocolate chip cookies stuffed with mini creme eggs makes an easy treat for Easter. Click here. 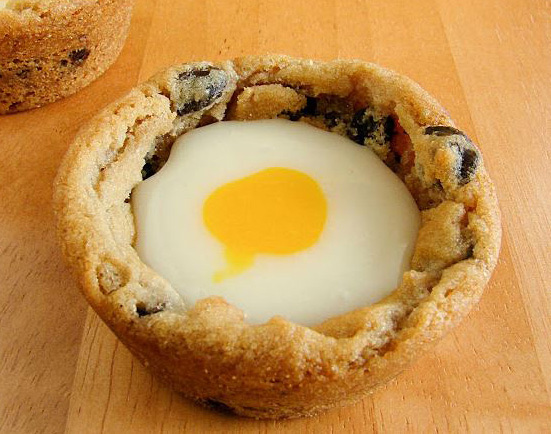 Cadbury creme egg cookie cups, photo courtesy of inkatrinaskitchen.com. Homemade Cadbury cream filling stuffed into chewy chocolate chip cookie cups. Click here. 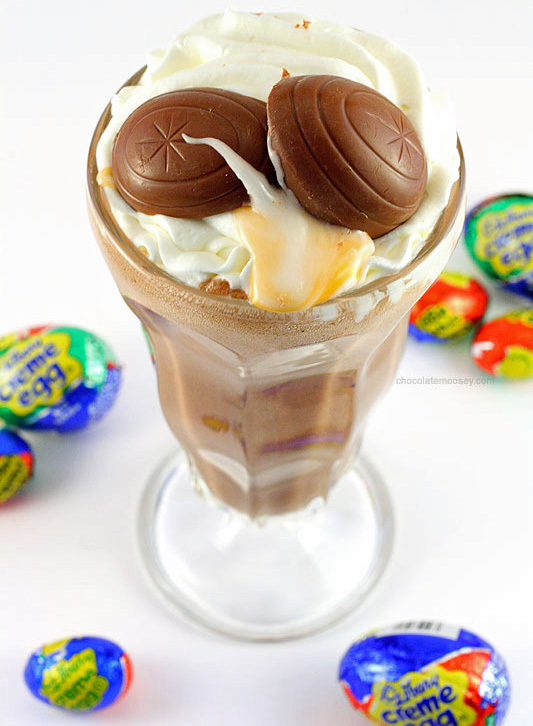 Cadbury creme egg ice-cream, photo courtesy of culinaryconcoctionsbypeabody.com. 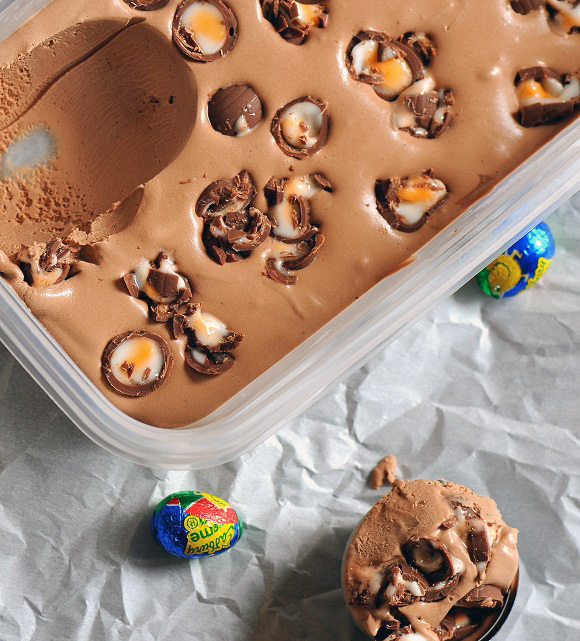 Delicious, smooth and creamy, chocolate creme egg ice-cream! This might be my favorite of them all. Click here. Cadbury creme egg chocolate caramel shortbread, photo courtesy of kerrycooks.com. With a scrumptious shortbread layer on the base, paired with gorgeous homemade caramel, and topped with a thick layer of milk and plain chocolate, these are a must! Click here. 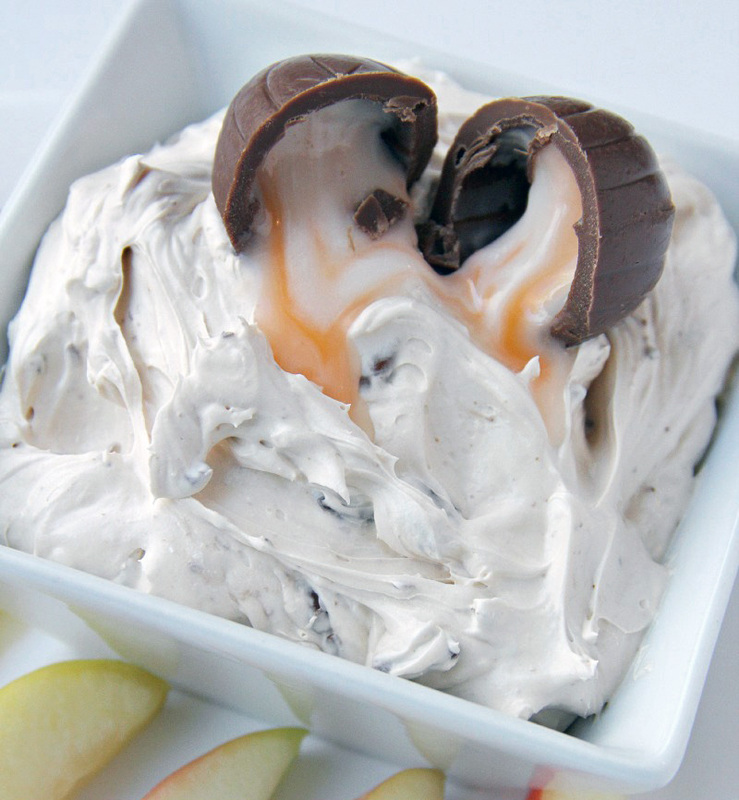 Cadbury creme egg dip, photo courtesy of bitzngiggles.com. Melt some eggs, chop up the others, and you end up with a sweet, creamy dip swimming with Cadbury egg bits and pieces and swirled with the white and yellow fondant filling, great for fruit dipping too! Click here. Cadbury creme egg tarts, photo courtesy of outoftheordinaryfood.com. 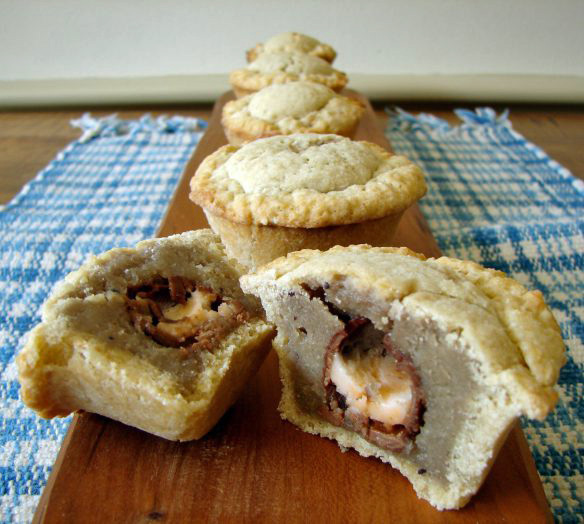 Little tarts, with a paté sucrée crust (kind of shortbread-y) a blackcurrant-almond filling, and one mini-egg hidden in each one. Click here. So, have you ever made any desserts with these yummy Cadbury creme eggs? If you have, I’d love to have the recipe! So I‘ve been a bit bummed lately with some of my favorite shows coming to an end, such as Parenthood and Cougar Town and very disappointed in the way Revenge is heading. Luckily, I’ve picked up a few new ones. 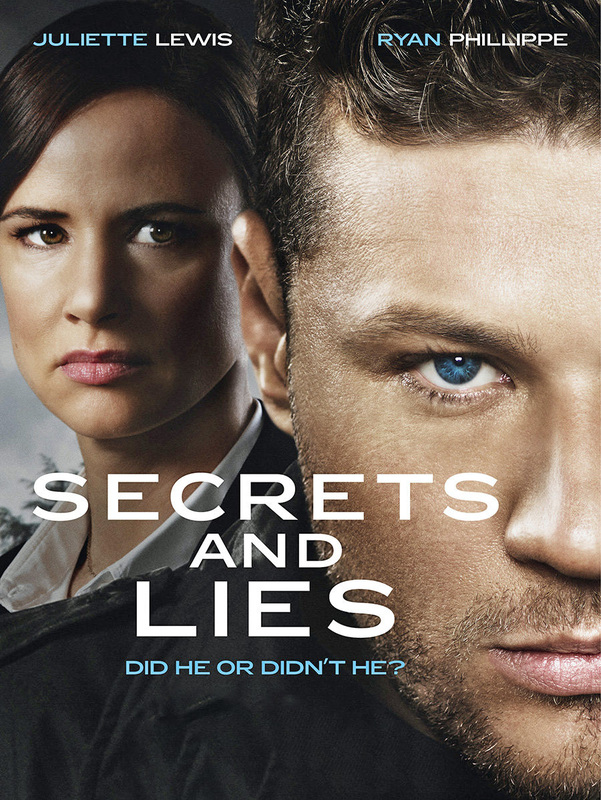 I have now added The Slap, Secrets & Lies and The Affair to my weekly rotation of programming. First let me say, it’s very odd for me to watch any of these three shows, because I would normally be very turned off with topics such as, child abuse, child murders and infidelity. But these shows are like a bad train wreck that everyone stops to look at. After watching the trailer for The Slap, I thought it looked ridiculous, (especially since it was replacing my beloved Parenthood). But I was intrigued, after all, who in today’s world would dare touch someone else’s child, much less, slap them?! So, I watched the first three episodes, and I must say, I find it very interesting, and I can’t wait to see how this story develops. It also feels as if you’re watching an HBO or Showtime series, instead of a primetime NBC program. This is about more than just a child being slapped…this show deals with the intricacies of a large Greek-American complicated family, and their close friends. But primarily it examines how ordinary lives can be derailed in an instant with a quick, unplanned act. There’s also a great cast here, starring Peter Sarsgaard, Thandie Newton and Uma Thurman. And last but not least, The Affair. To be honest, I hated this show the first time I watched it. 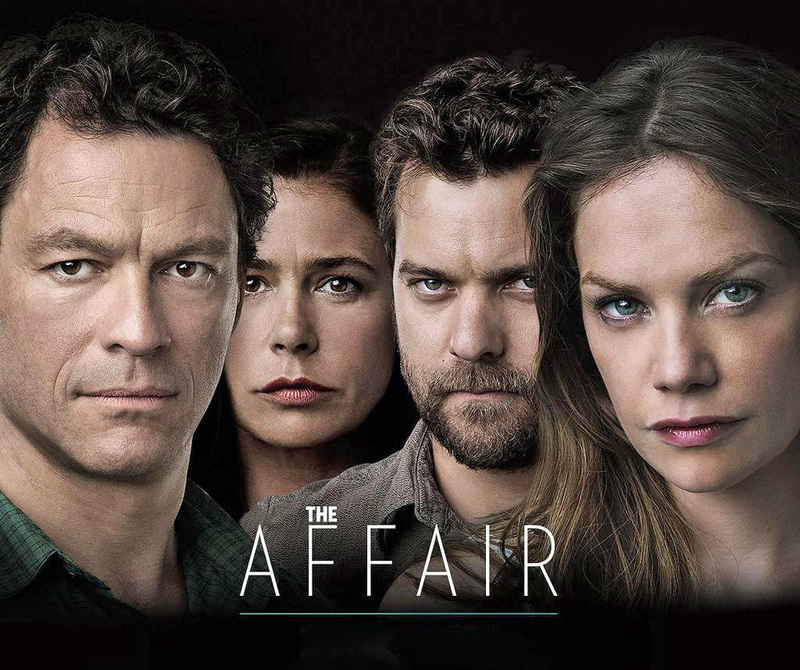 The Affair explores the emotional effects of an extramarital relationship between Noah Solloway, played by Dominic West and Alison Bailey, played by Ruth Wilson, after the two meet in the resort town of Montauk on Long Island. Although, after having watched the entire first season, I have to say, the storyline grows on you and you start to understand all of the characters’ point of view. Perhaps what I enjoy most, is that the story of the affair is told separately, complete with distinct memory biases, from Noah’s and Alison’s perspectives. It’s very well written and the season left us wanting more, with a fantastic season ending cliff hanger. I also love the roles played by Maura Tierney and Joshua Jackson. The series recently won the Golden Globe Awards for Best Television Drama Series and Ruth Wilson won for Best Actress in a Television Series Drama. Looking forward to Season 2. Have you been watching any new shows lately? Any that you would recommend? 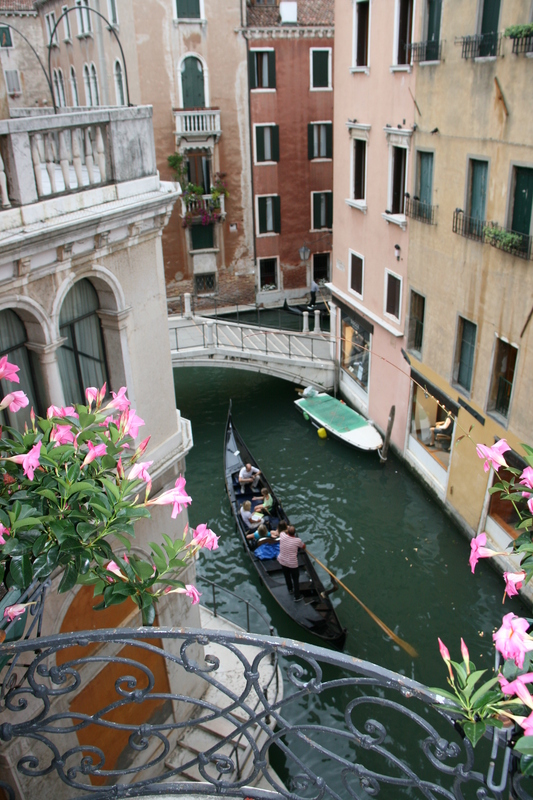 Experiencing Venice is like falling in love at first sight. To many, Paris is considered the most beautiful city in the world. 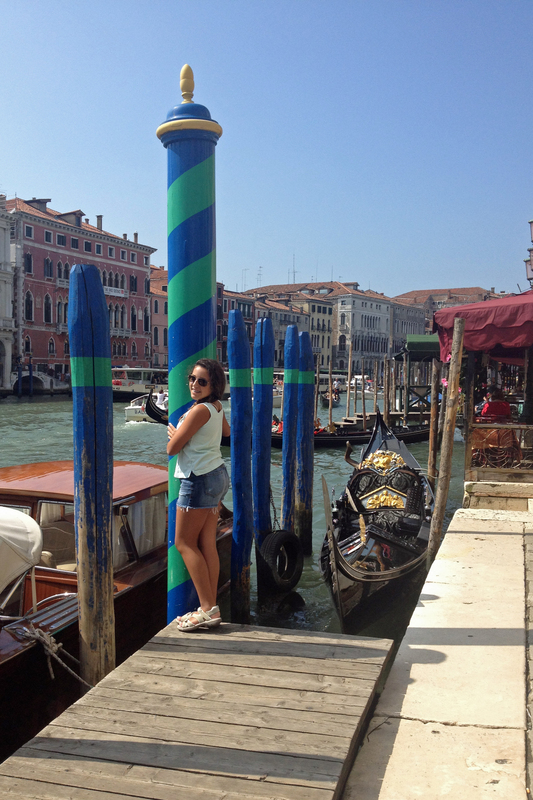 To me, Venice is. 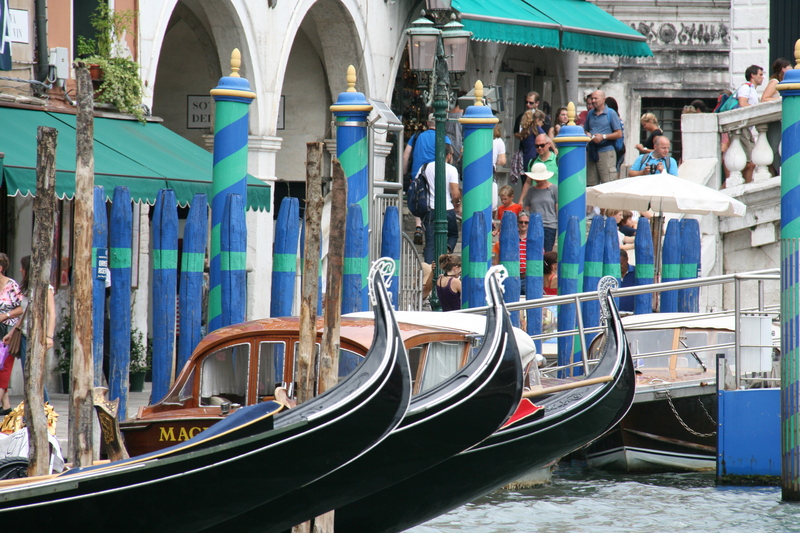 All of the beautiful architecture, the canals, the gondolas, I just find it amazing (it’s a UNESCO World Heritage property). Since my first visit when I was fifteen, I always found this enchanting city to be very unique. I love that you can walk everywhere, no need to rent a car. 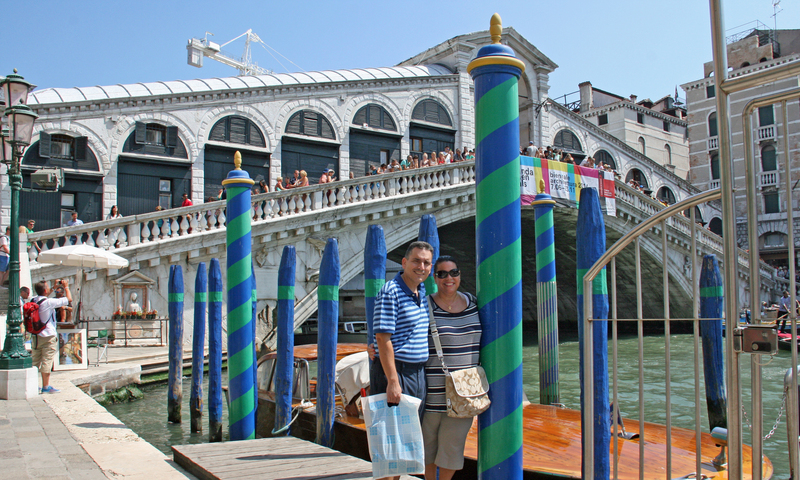 But make sure you hop on the vaporetto (water bus) which gives you a wide angle view of Venice’s beauty that you just can’t get by walking around. 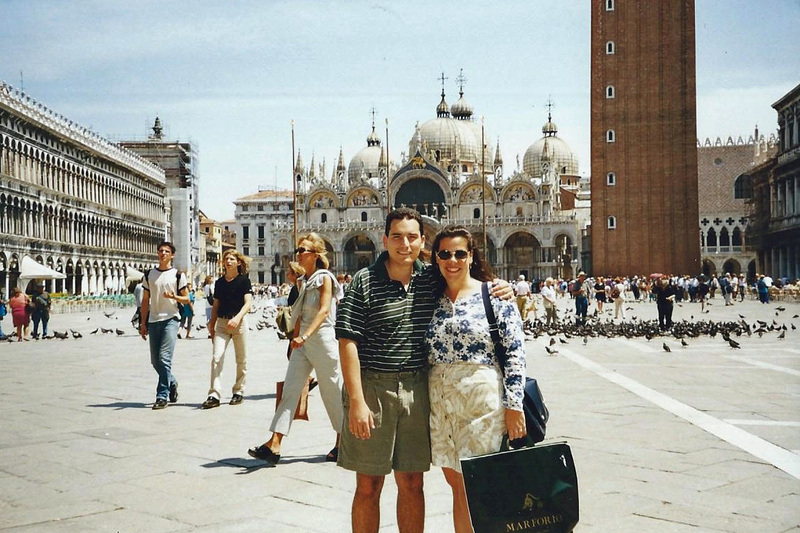 I also love to wander and get lost through all of the winding, narrow cobblestone streets, and the further you venture away from Piazza San Marco (St. Mark’s Square), the quainter the neighborhoods become, San Polo being my favorite. 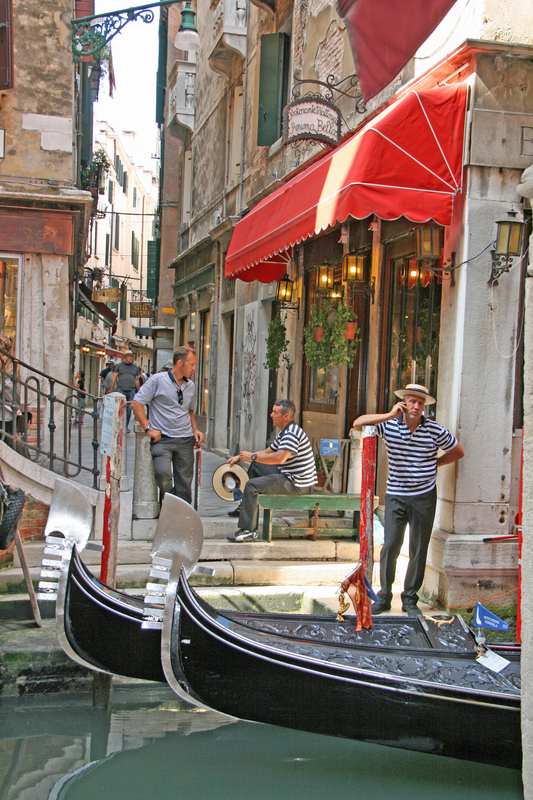 San Polo is a quarter of artists and artisans, with narrow streets and tiny “campos” or squares. But what I love is that people actually live here in the tiny apartments above the many shops and restaurants, giving you a real neighborhood feel. Make the most of your time exploring through tiny alleys, across endless bridges, and make sure to just take it all in, while stopping for a coffee or gelato along the way. Places to Stay We typically fly into Venice and take a water taxi from the airport. 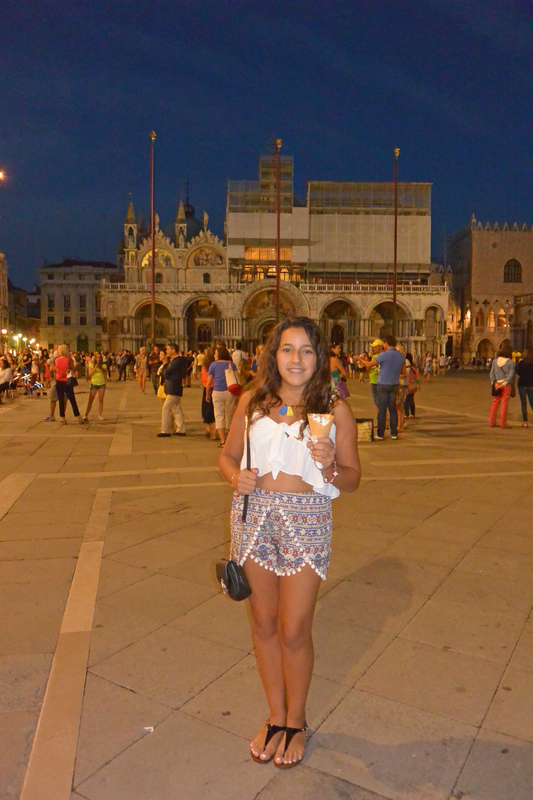 I really like staying close to St. Mark’s square, as the location is very convenient. This last time we stayed at the Residence Corte Grimani and were very pleased. We stayed in a one bedroom apartment (which for Venice is huge) for the three of us, and our daughter was thrilled to learn she had her own bathroom. 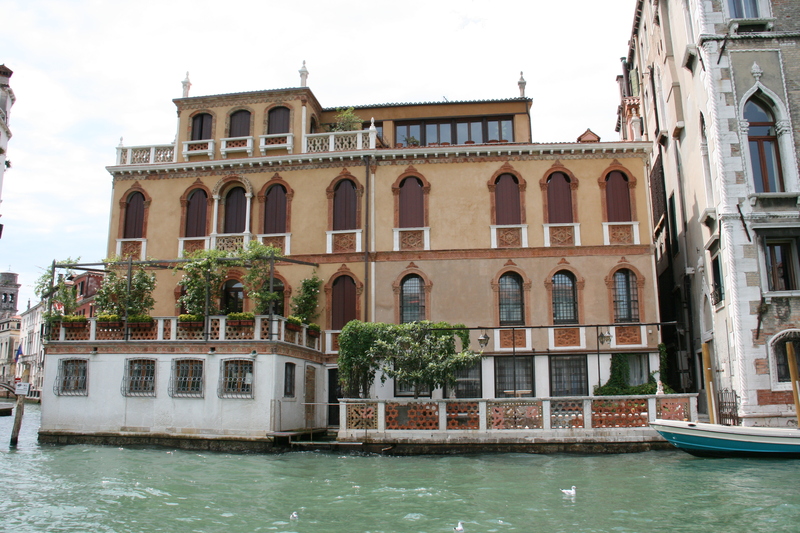 Situated steps from St. Mark’s, the property is very comfortable and we had amazing canal views from our windows. I highly recommend this hotel if you’re traveling with children. 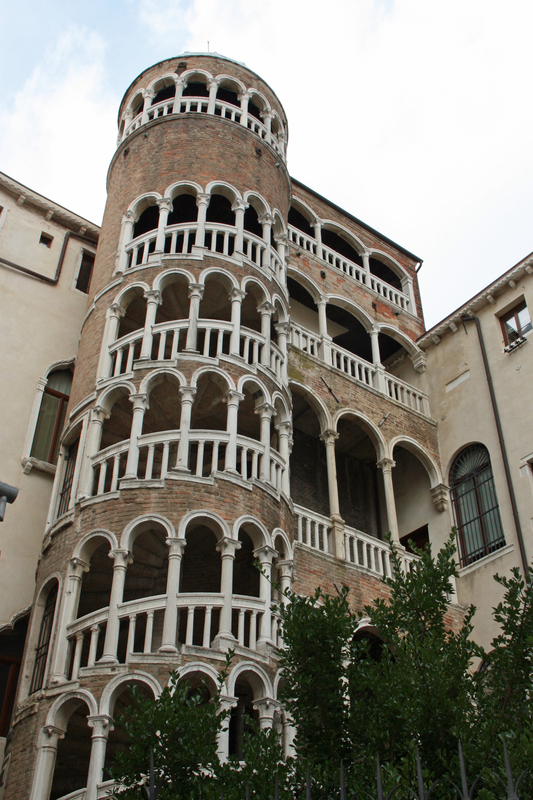 Other nice hotels where we’ve stayed in the past are the Cavaletto and the Bonvecchiati, both very near to St. Mark’s also. Important to note, it’s good to find a hotel that has water taxi or water bus access, so that you don’t have to carry all of your luggage through the cobblestone streets. View from our apartment window…priceless! 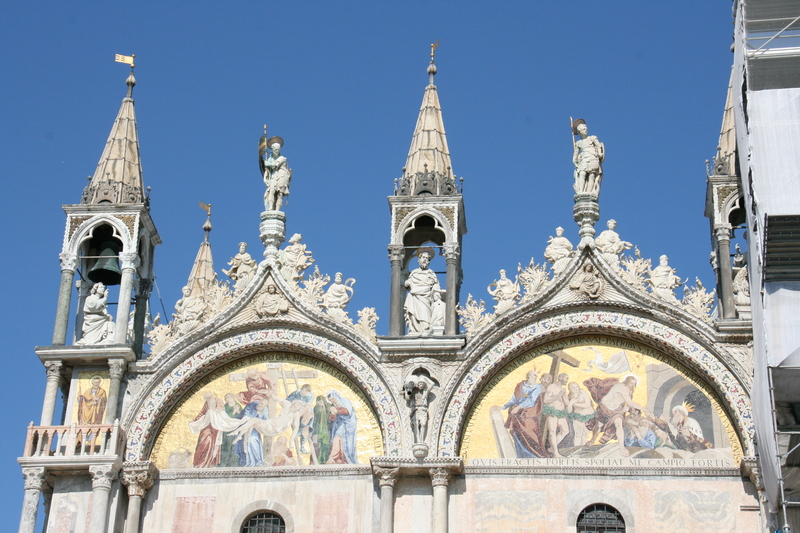 Churches As with most major Italian cities, Venice has many gorgeous churches to visit. 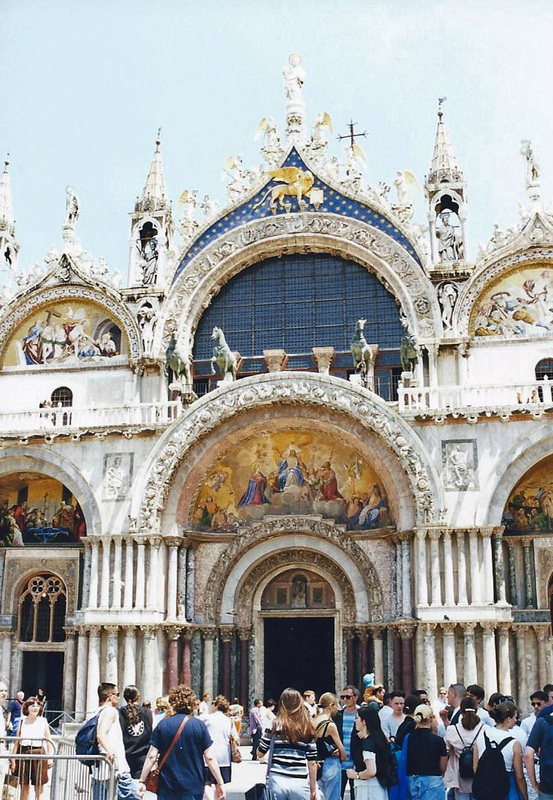 My favorite of course is Basilica di San Marco, one of my favorite churches in all of Europe and one of the finest examples of Byzantine architecture in the word. Words cannot describe this amazingly beautiful sanctuary, it’s truly a must see. 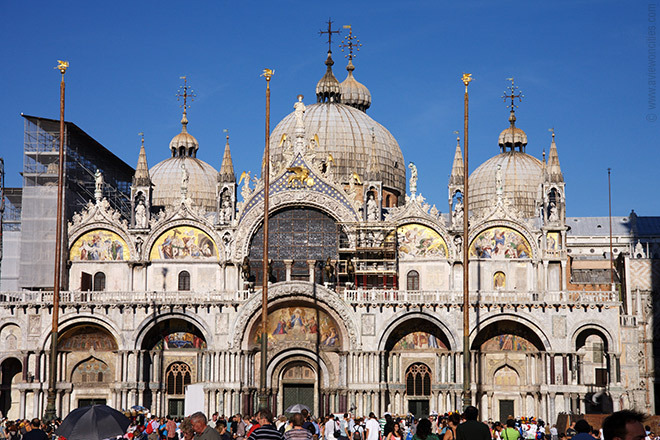 Another church I love in Venice is the Basilica di Santa Maria della Salute, with its prominent position at the tip of Dorsoduro, where the Grand Canal merges with St. Mark’s Basin. Gondola Rides We visited at the peak of the high season in August, it was extremely busy and the crowds were everywhere. 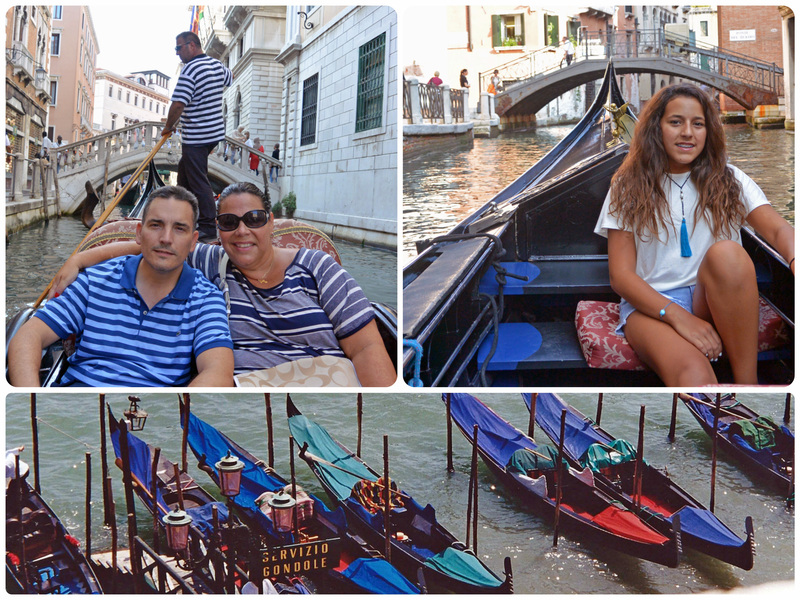 Though I have to admit, as much as I love my gondola rides, the tourist crowds were making us feel like we were in a Disney World queue. 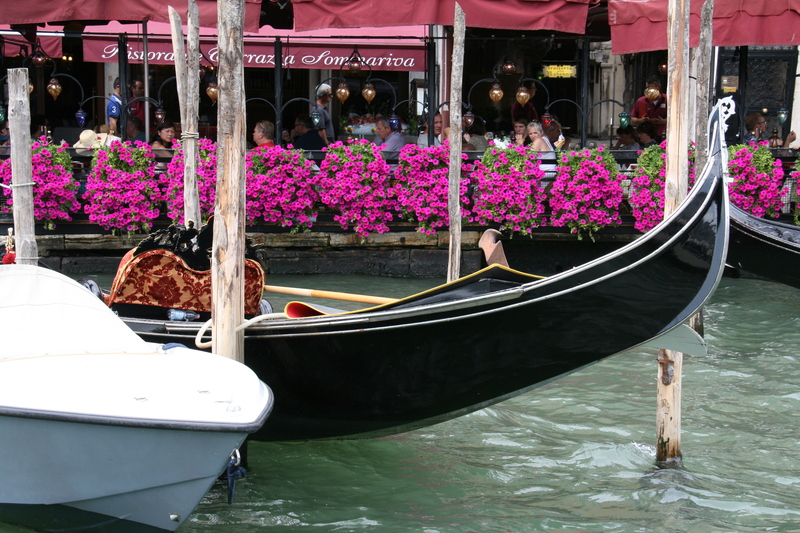 But a gondola is just one of those things that a visitor to this lovely city should experience. 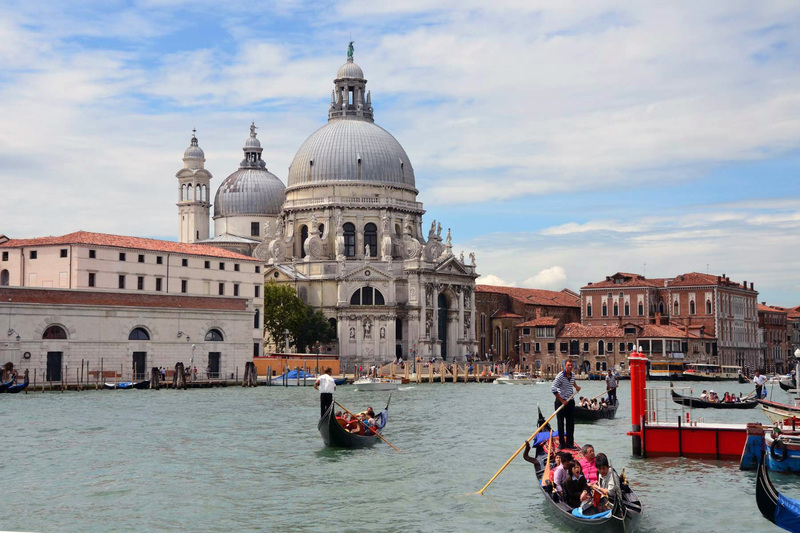 Venice is all about the water. I definitely recommend visiting in May or September instead. 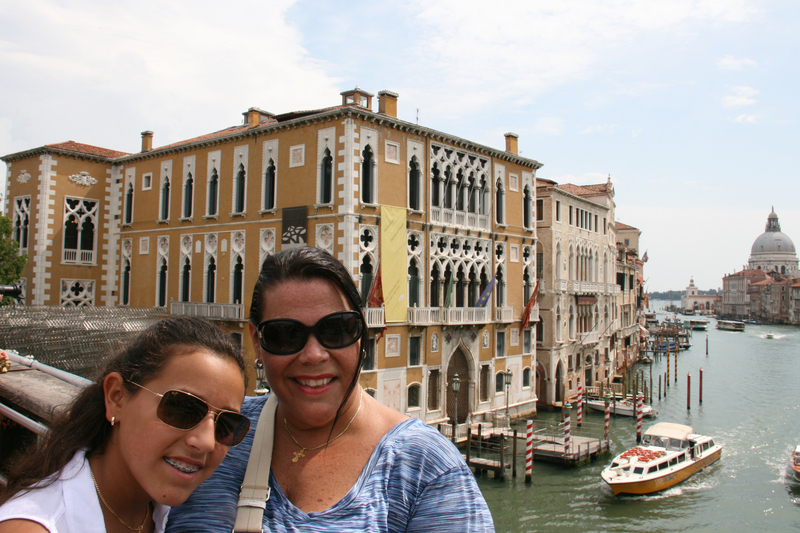 But this was our daughter’s first trip to Venice, so of course we had to take her on a gondola, which she loved. 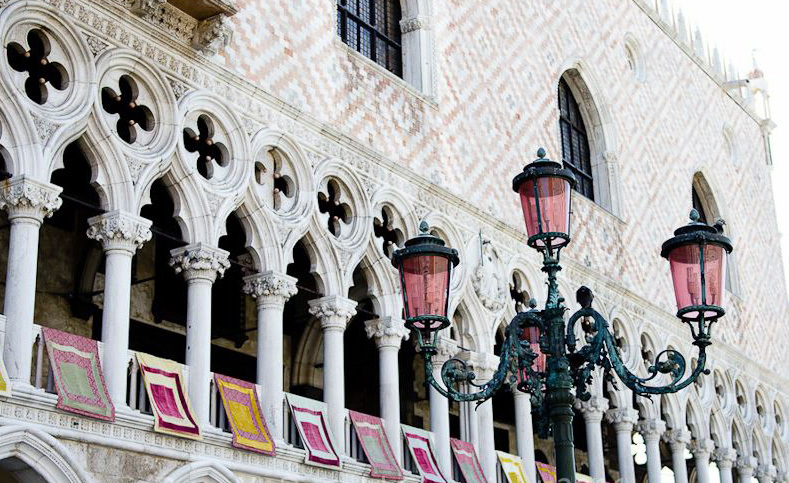 Food Finding delicious eateries in Venice is not a problem. 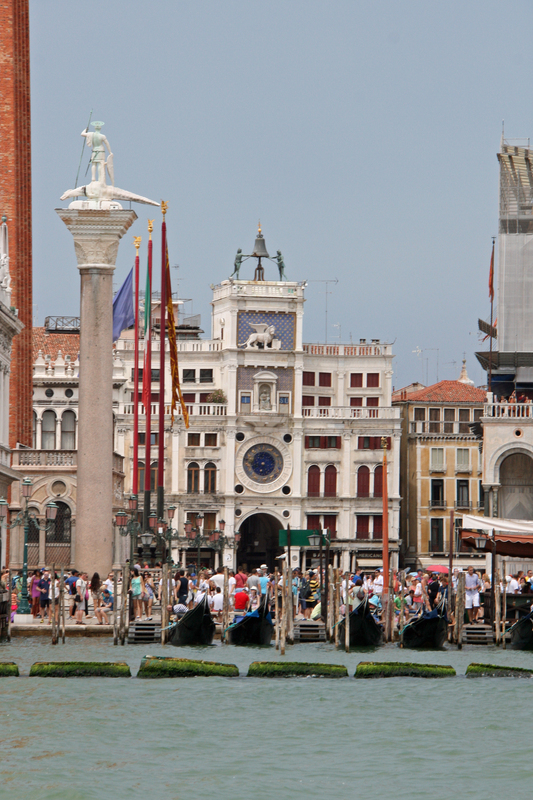 There are tons of great restaurants to choose from, yummy gelato places (Venchi being out favorite), and many pizza and fast food spots to get a quick meal, throughout the entire city. 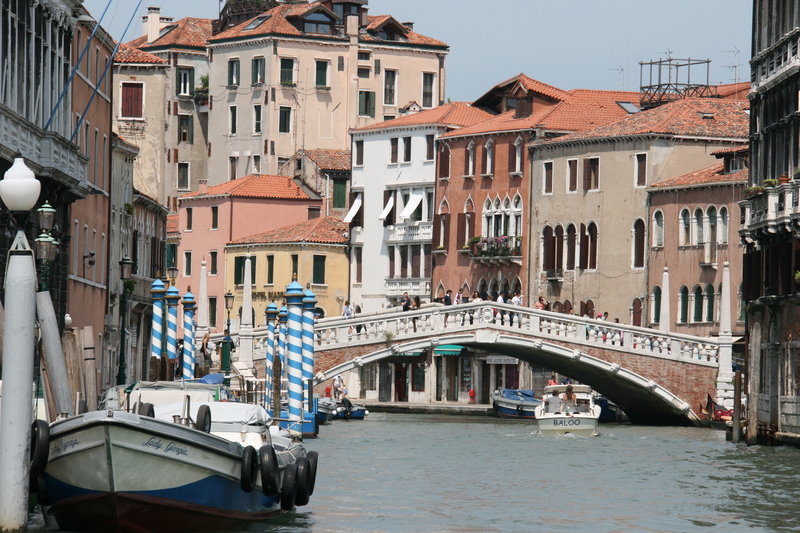 I had not been to Venice in many years prior to this visit last summer, and I was pleasantly surprised to not see any Starbucks, Burger Kings and only one McDonald’s further out in the Cannaregio neighborhood. Some of our favorite restaurants which we frequent on every visit are Antico Martini, Le Bistrot de Venise and Trattoria Da Mamo. 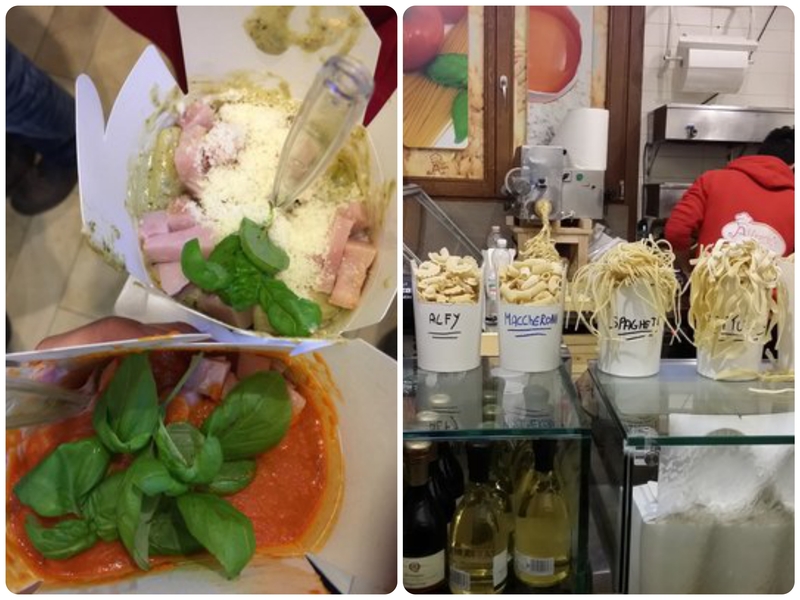 And if you’re looking for a quick bite and don’t have time for a sit down meal, you have to try Dal Moro’s Fresh Pasta To Go (Calle de la Casseleria, 5324 in Castello). The pasta comes in a little white takeaway box with a fork and napkins, and it’s up to you to find a place to enjoy it. 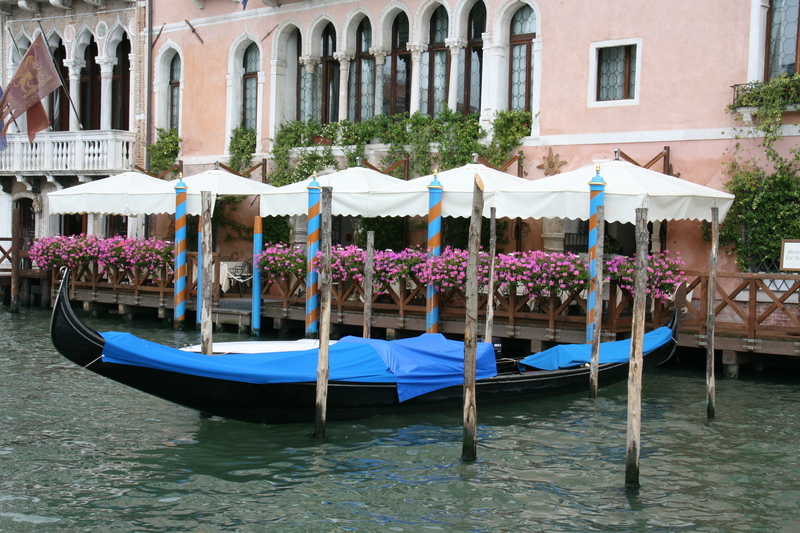 The pasta is really fresh, made when you order it, and very reasonably priced for Venice. 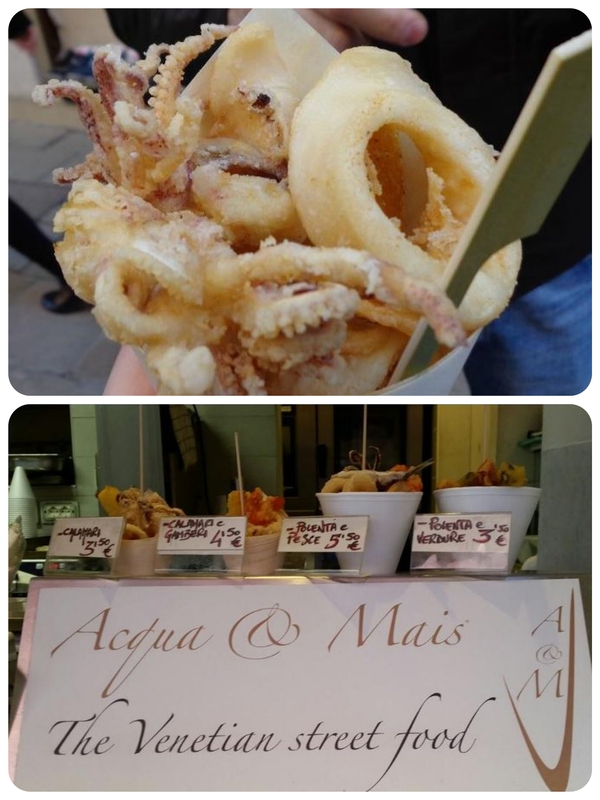 Another great place is Acqua & Mais (Campiello dei Meloni, 1478, San Polo) a Venetian take-away delicatessen where you can taste the seafood directly from the Rialto market. 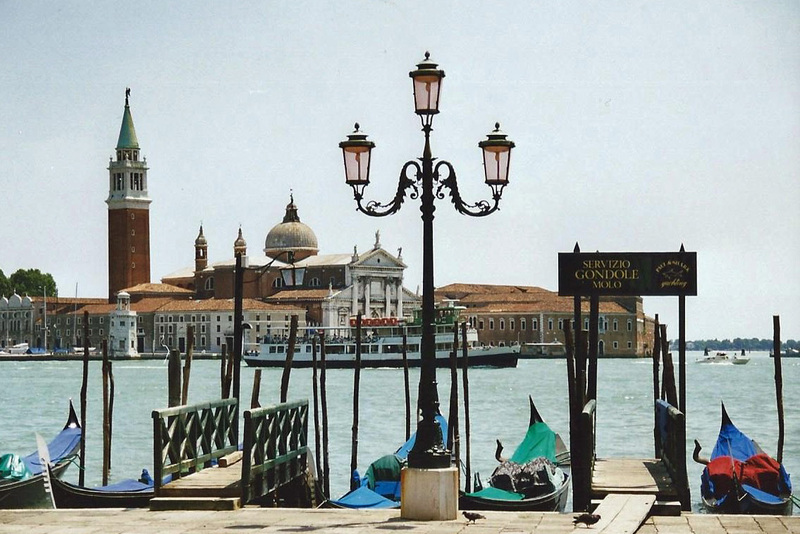 The specialties include the “scartosso” real Venetian mixed fried fish served in a paper cone so that you can enjoy it while strolling through the streets of Venice. 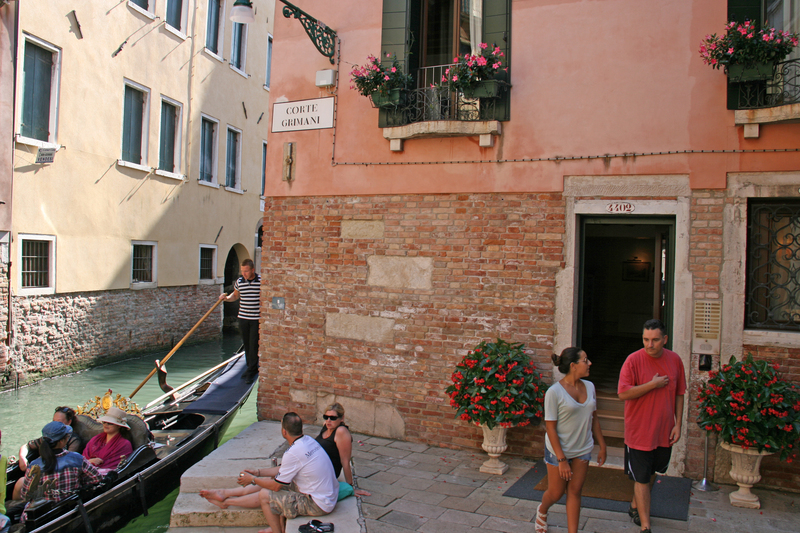 Windows allow a full view of the cooks while preparing the food and prices are again very reasonable for Venice. Paper Shops As many of you know, my love of stationery products comes alive when I’m visiting Europe, in particular, Italy. 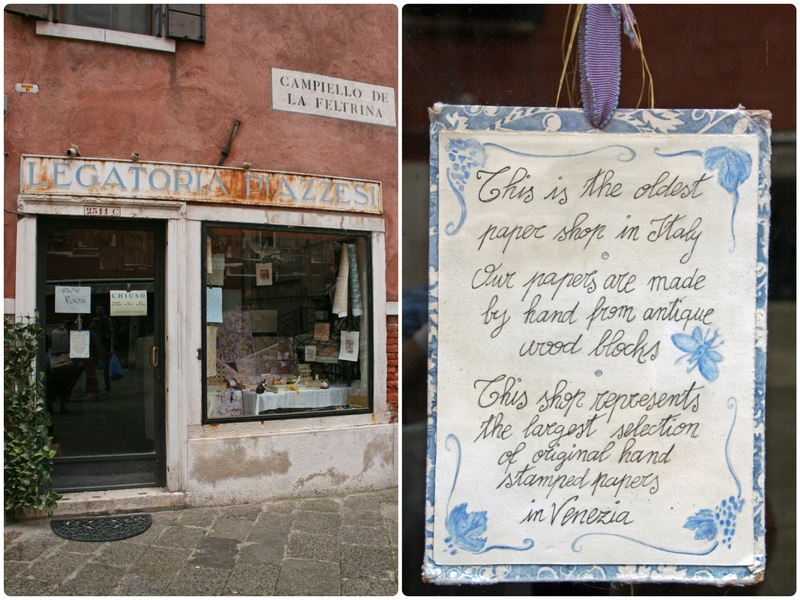 Venice has many gorgeous little shops selling handcrafted marbled paper, embossed stamps and beautiful pencils and notebooks. The most common one you will find is Il Papiro, this is a chain with various locations throughout Italy, several within Venice, and even shops in Palm Beach and New York. But there are a few others to look out for as well. I really wanted to visit, Legatoria Piazzesi, (Campiello de la Feltrina near Campo Santa Maria del Giglio, San Marco 2511), Italy’s oldest paper shop, which has been making books and paper since 1951. Unfortunately, it was closed during our stay, and apparently it’s closed a lot from reviews I have found on the internet. The collages in the window were beautiful and I read somewhere that the artist says that they are portraits of the tourists she sees walking by her shop! I would have loved to buy one, maybe next time (because of course, they will be a next time). 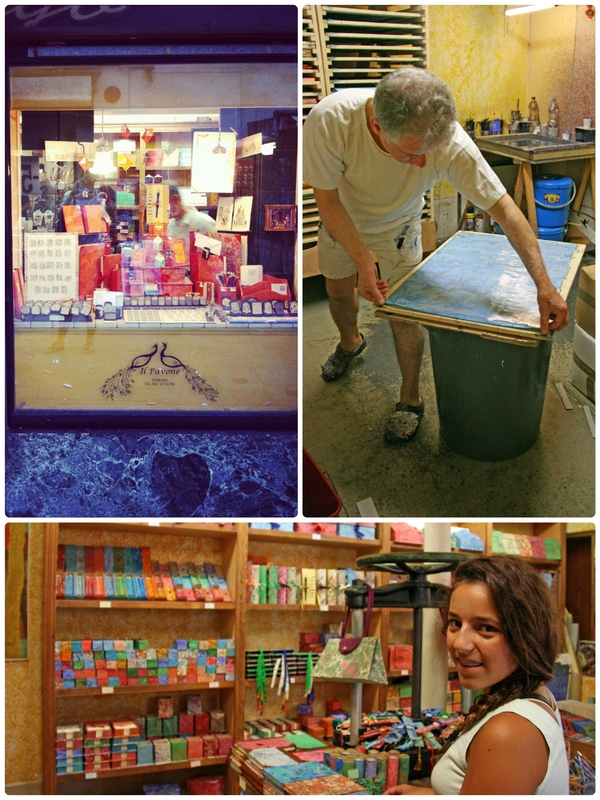 Il Pavone Paper Shop, amazing to watch the shop owner make the marbled paper. La Ricerca (Ponte delle Ostreghe near Campo Santa Maria del Giglio, San Marco 2431) is another beautiful little paper shop selling leather-bound photo albums, address books, pencil pouches, you name it (by now you’re probably wondering how many of these places did we shop at). And according to Fodor’s, new products are introduced often so that no two visits to the store are ever the same. 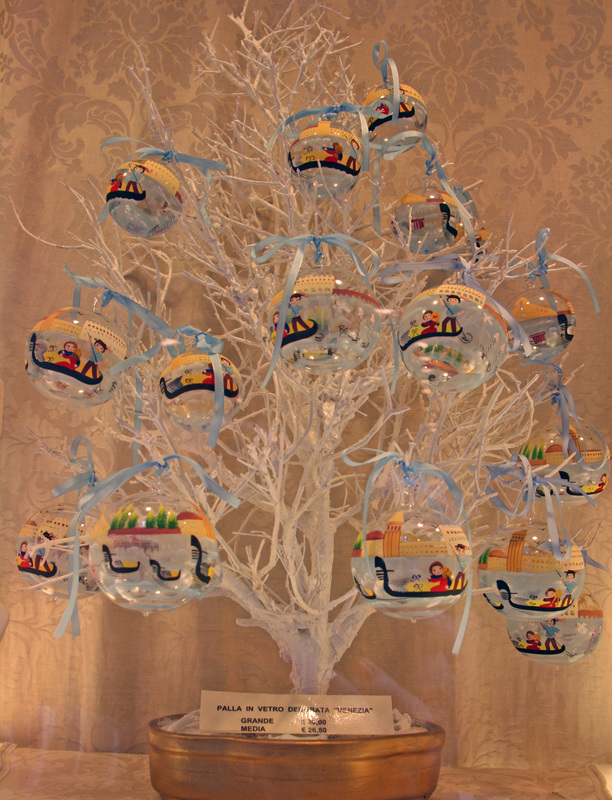 One store that has some beautiful glass items, and very special hand painted Christmas ornaments is Eredi Giovanni Pagnacco, right off St. Mark’s square, definitely worth a visit. You can also visit some glass workshops and watch demonstrations if you’re interested. 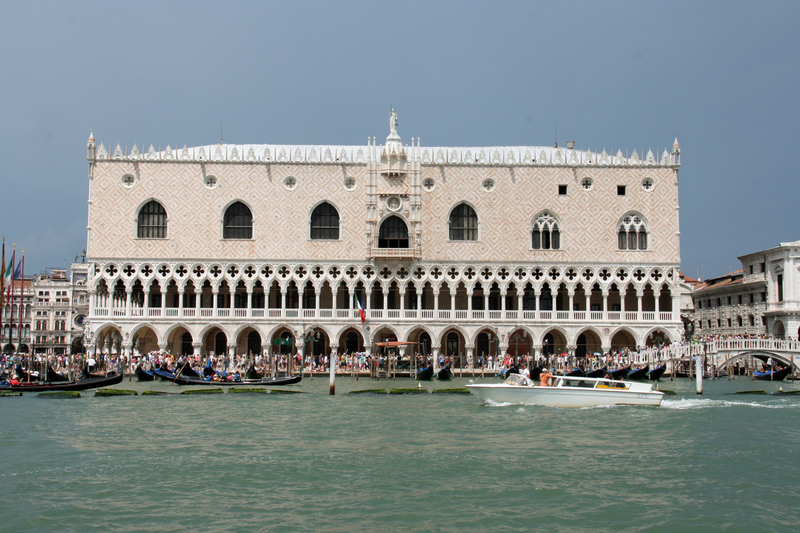 Vecchia Murano Glass Factory, in the heart of Venice, just a few yards from Piazza San Marco, is one of the lagoon’s biggest and most famous artistic glass factories. 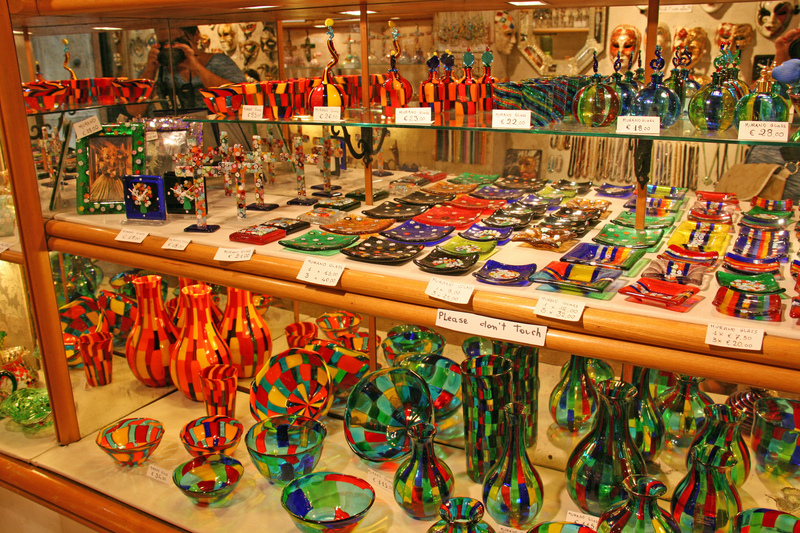 You can visit the store which sells all types of glass items and some very pretty glass jewelry, and skip the glass making demonstration. 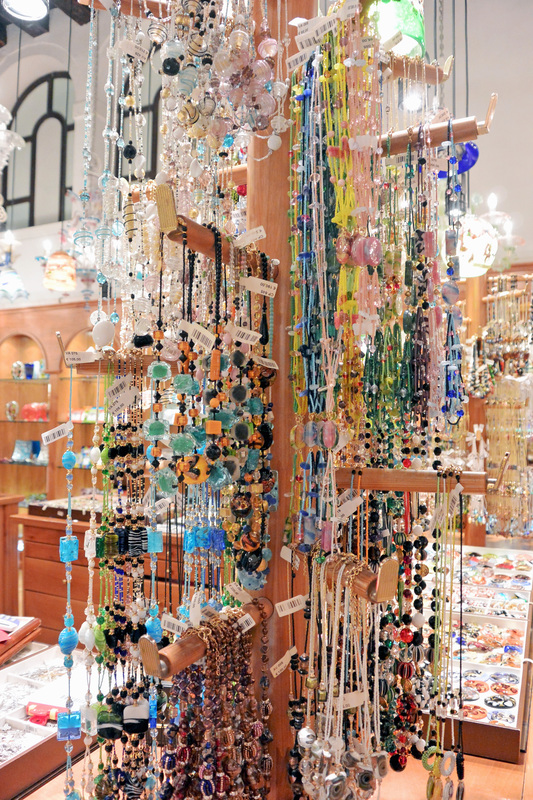 The beautiful glass jewelry available at Vecchia Murano. 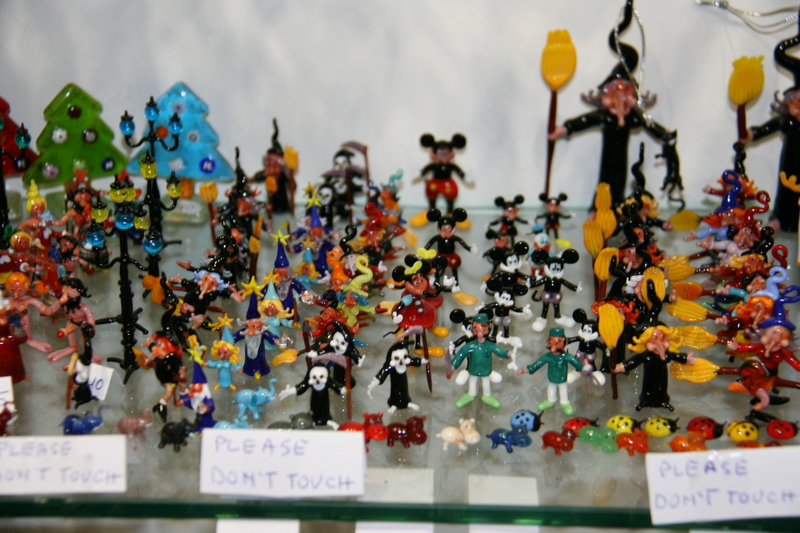 However, I recommend you visit the island of Murano if you’re looking for a specific piece. 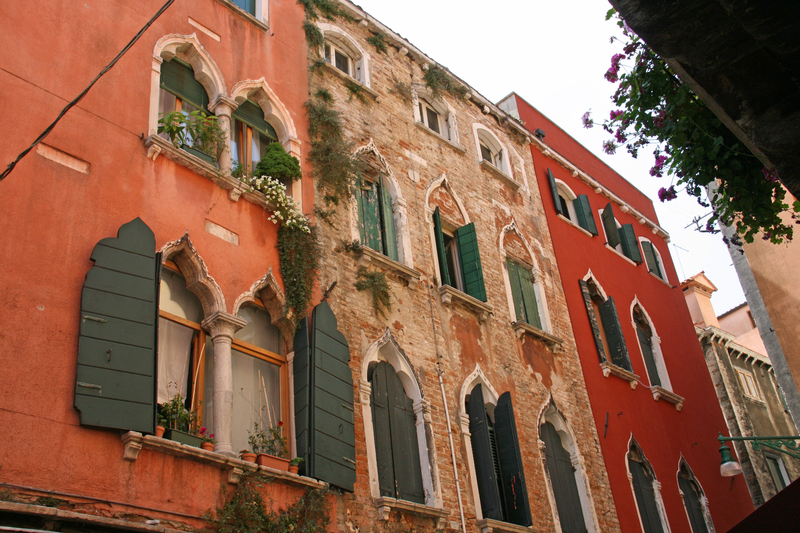 Day trips to Murano and Burano are great if time permits. 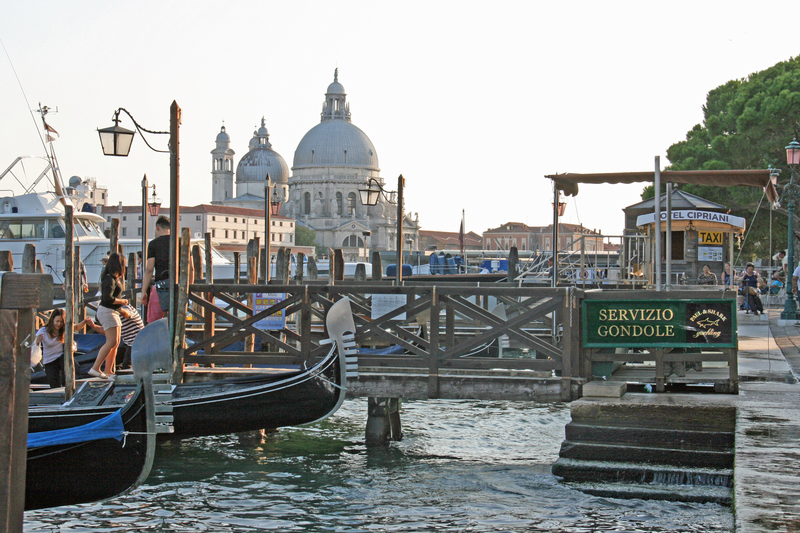 One of the many gondola stations. 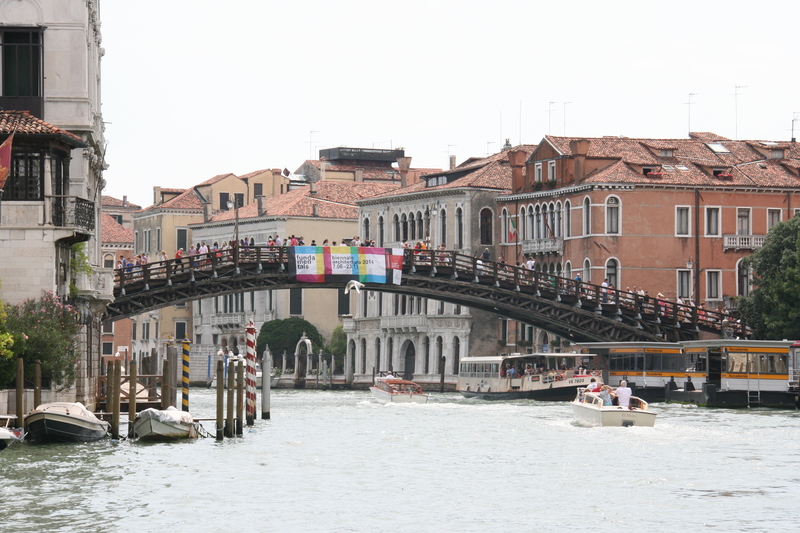 The beautiful wooden Ponte dell’Accademia, linking Dorsoduro to San Marco.